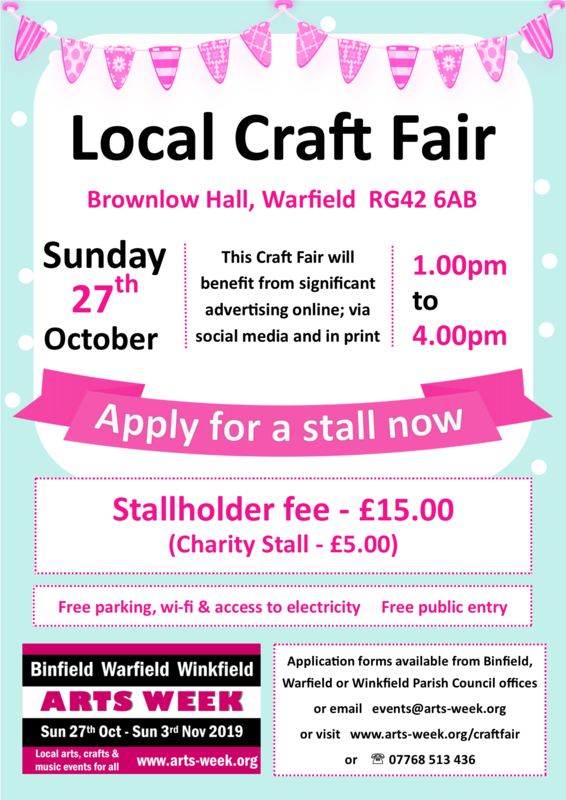 It is indoor at Brownlow Hall Warfield RG42 6AB with a maximum of 29 stalls (based on a six foot table or an equivalent space). Set up is Sunday 27th October 2019 between 10.00-12.00. Take down and removal same day 4.00-5.00pm. There is an online application form further down this page. By cheque (payable to Warfield Parish Council). Posted or brought in person to the offices of Binfield, Warfield or Winkfield Parish Council addresses listed above. Write this reference on the back of the cheque "CF19 and your surname"
Direct Funds Transfer (Warfield Parish Council. Lloyds Bank Sort Code: 30-91-11 Account No: 00215609 Use this reference:- "CF19 and your surname"
The organisers alone will determine whether your stall application will be accepted and where your stall will be placed in the Brownlow Hall main hall and adjacent rooms. The organisers reserve the right to decline applications and/or participation for various reasons including the following - this is a not an exhaustive list. Items offered must not be dangerous, toxic, illegal or anything unsuitable for a family audience; jumble; health products making unproven health benefit claims; live animals; mass produced high street lines. Stall holders should not ignore advice and instructions given by the Organisers and their official representatives or be abusive or threatening in any way.